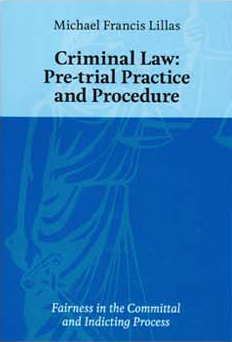 This work is devoted principally to the procedure to be adopted by defence and prosecution prior to a criminal trial. The legislation of all States and Territories of Australia are embodied in the work which is arranged by subjects rather than the statuary provisions. It is designed to assist both old and young practitioners in charging and defending persons who have allegedly committed a criminal offence. The arrest of an accused person and the decision to lay charges is considered followed by the committal or preliminary examination of the alleged criminal conduct. Committal proceedings have undergone a huge transformation in all States and Territories. Parliaments have legislated to stream line and improve the method by which an accused is acquainted with the evidence and the likely criminal charge which may be laid against them. The colloquial analysis of this Parliamentary intervention suggested by many practitioners was that committals had been abolished. This is not the case. What has happened is the right to cross examine witnesses at the committal hearing has been limited. Defence must if they are to cross examine any witness at a committal hearing obtain an order or direction from the relevant court to do so. This procedure requires a different approach by defence. It is submitted that it's not entirely new in the practice of criminal law and is akin to making an application for a voir dire in a formal trial applying the statutory framework and judicial pronouncements when making the application in the interests of justice at the preliminary hearing. What must happen in all jurisdictions is that prosecution must make full and complete disclosure of all relevant evidence obtained in the investigation of the alleged crime. Disclosure by the prosecution is one aspect of giving an accused a fair trial. The object of a fair trial being one of the hallmarks of a civilised society. Prosecution as an arm of the executive government must act in an exemplary manner towards the citizens of the state and if there is a significant failure or departure in the conduct of the prosecution defence must urge the court to use its powers to stay the proceedings. The manner in which the accused is charged or indicted for their formal trial is another aspect of criminal law procedure where prosecution must act with fairness to the accused. This work has been directed to the concept of providing a fair trial of an accused in the committal and indicting process by outlining the process and course to be taken by prosecution and defence. Pre trial applications by the prosecution and defence for such matters as particulars, jury selection, judge alone trials, place of trial and like matters are examined. Prosecutors conduct prior to and during the formal trial has been considered using the leading pronouncements of the Courts. The duty to call all relevant witnesses and the manner in which a prosecutor may address a jury is included. The necessity of both prosecution and defence to test the veracity and plausibility of expert witnesses has been in the judgments of Appellant Courts. "An accused person is entitled to a fair trial. The criminal law provided this by a committal hearing, a jury as judge of facts, the right to silence, and a burden of proof beyond reasonable doubt. The committal hearing disclosed to the accused the case they have to meet. Prosecution has to determine the correct charge providing adequate particulars of the crime. The application of fairness in the pre-trial disclosure and indicting process is important in achieving a fair trial of an accused. A book on these aspects of the criminal law is about to be published covering all State jurisdictions and some from overseas. The history and philosophy of committals and the gradual reform undertaken by the States have been marshalled leading up to the dramatic departure from a committal hearing to disclosure by prosecution of its case to the accused. The duties of prosecutors at trial have been included particularly the power to end a trial by nolle proseque and the right of Defence to make a no case submission. The courts power to quash an indictment because of abuse of process is also examined. From 1986 and beyond 2000 Parliaments have made dramatic changes to committal hearings with the role of defence in cross examining witnesses severely curtailed and the duties of disclose reinforced. This has occurred in fits and starts with similar procedures being introduced in each State, Victoria 2009 and the latest Queensland 2010. The book collects and compares the changes in each jurisdiction. The component on indictments has been arranged following the chapter in the codes devoted to the rules relating to indictments. Commencing with the place of trial and the power of the court to change the venue and culminating in the courts power to quash a bill. Ex officio indictments and the circumstances in which their use may not be unfair to an accused are examined. The principles applicable to joinder of accused and counts in the one indictment is explored and explained. Provision of particulars and the power to amend an indictment is another example of the classification of the material in the book. Each jurisdiction is included by providing a reference to the states legislation at the beginning the chapter. The aim of the author is to provide a practical aid to an area of criminal law where there has been little attention by others to this important aspect of fair trial. Michael Lillas a practitioner of 39 years and his team of State Revising Editors* have achieved that aim. The work along with the Digest of Tasmanian Supreme Court judgments, Annotated Evidence Acts, Cases and materials on sentencing Pleas in Mitigation will be a welcome help to many prosecutors and defence." Criminal Law: Pre-trial Practice and Procedure is a well set out and particularly detailed reference guide to the pre-trial procedures and practice a practitioner might experience in criminal law across Australian jurisdictions. A perusal of the table of contents highlights the great depth that the author has gone into when creating this text. The contents set out the relevant matters from all jurisdictions from arrest through to basic sentencing considerations, providing helpful insight and guidance to both junior and experienced practitioners alike. The text is set out chronologically and, initially, appears to be somewhat similar to Ross on Crime. However the detail to be found in Mr. Lillas book exceeds that which the reader might access through other texts. Given it is truly multi-jurisdictional, it would be of particular assistance for lawyers who practise criminal law in multiple states. The necessity for this text to be updated as changes occur, in what is a rapidly changing area of law, will be imperative and it will be essential that those assisting the author in updating the text are vigilant to legislative and case law development. The necessity to obtain updated versions given the rapid pace of change in criminal law may be the only downside to the text. As the target market is significantly likely to include law firms, a loose-leaf service may be worthy of consideration in the future. The author's preface identifies that the genesis for the book was to 'write a handbook for legal officers in the Queensland Director of Public Prosecutions Office when employed in that office. The final product has exceeded that goal and is a reference text suitable for practitioners of all levels, with Mr. Lillas creating a reference text that practitioners will find easy to use and of beneficial to their practice of criminal law.